Double Shot of Annoying Birthday Obsessions. Other than onions and garlic - which made me decide not to do the chopping and dicing whenever I wanna cook (leave that to my kakak) .. never be a smarty pants to eat curry with your hands. Well, although it's much more enjoying to indulge in Indian cuisin with no better way to do it traditionally .. the spices just stains my hands .. and the stench just stays there for a day, and the tumeric makes my fingernails yellow. Now that's attractive. I've never really been a big fan of the brand for mobile phones .. but I have to admit, the designs are really sleek and style. B-E-R-G-A-Y-A phone .. well, other than the Motorola, yet another "bergaya" phone. And I think I hvae to stop my procrastinations on how un-userfriendly the phone is ... that was based on the samsung clam-phone I used waaaayyyy back like 8 years ago *sweat* - Ok .. I'm sorry. Speaking of style ... 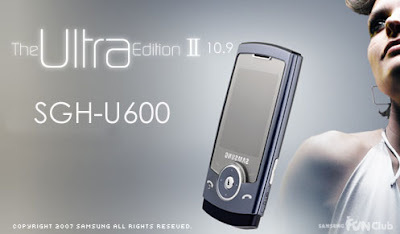 The Ultra Edition II of SGH-U600 is D-Style phone. Features that attracted me ..
We were checking the phone out yesterday, and he had an itch to get it so badly .. who doesn't?! And I ... well, I was the wet blanket and went rantling on wasting money, no point, no need, urs still so new, just spent so much on repair, bla bla .. yadda yadda ..
... and I woke up this morning thinking about it. Just great! The day I discovered I actually have a number of readers to my blog. Although the number isn't as huge as those that top the blogosphere with thousands of readers visiting each day, but I'm still amazed that I actually have that many ... and international readers! Check out the stats .. I actually have an average of 50 people visiting my blog per day ... wow ! And I have readers from .. everywhere in Malaysia, Singapore, UK, Ireland, Indonesia, USA, Australia, Canada, Mexico, Dubai, Philippines and Japan. Awesome!!! Sorry if I have left any of you guys out. It really made me happy ... and I really meant it ... sincerely from the bottom of my heart! Nice phone..no 3G capabilities though. I never actually use the darn video calls on my phone but heck it's good to know you have the function! The slimmest there is for 3G is the Z720..it is just FANTASTIC! Want one? Yea..but it's jez too beautiful to say NO to it although it doesnt have 3G eh. Still confused on which to get..but definitely getting one for myself for my bday. either some generous soul outthere hears my pleas (so NOT and so DREAMING) or i'll jez get it for myself. been waiting for way too long! hahaha~ ur amusing! where are you from btw? glad to know i've readers from so far away .. not many ppl know abt my blog besides close friends. just curious, how did you stumble upon it? Ermmm..well..I didn't actually stumble upon it, let's just say I had a reason apart from simple curiosity..and that I didn't start out as a fan..but hey, you've definitely converted me! Like I said before, I find myself inexplicably drawn to your blog even though I hate blogs! Just wish I could actually get to know you in person..sophisticated women are certainly an endangered species these days! Oh well, such is life..one doesn't always get what one wants!